Could a Grandfather Clock Improve My Garden? 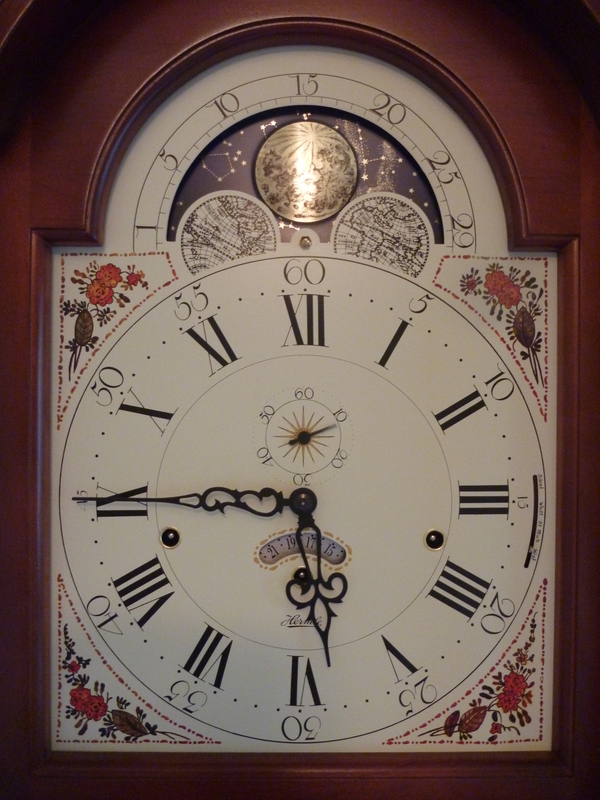 I met a fascinating clocksmith on Friday, when he visited my house to install a moon dial. It had fallen off during shipment of the grandfather clock I’d been dreaming about for much of my life. To me, a grandfather clock, with its carefully crafted workmanship, stands tall for the value of time well spent, art, and old-world charm. Large and unwieldy as it is, it symbolizes the opposite of this fast-paced technological age. Somehow, listening to its pendulum swing back and forth, a second seems longer; time slows down. The peace I feel may stem from childhood memories: spending the night at my grandparents’ house, sweet Grammy tiptoeing around our cozy pallet in the living room floor to silence the mantel clock’s chimes so they wouldn’t wake my sisters and me; or doing homework in our piano teacher’s lamp lit, tick-tocking study during my sister’s lesson. There was no question in my mind about the grand clock’s ability to enhance interior coziness and charm, but I had no idea it might benefit my garden . . . until Friday morning. The clocksmith attached the moon dial (which my husband and I were too nervous to attempt) in a matter of minutes. As he set it, he spoke of moon lore. 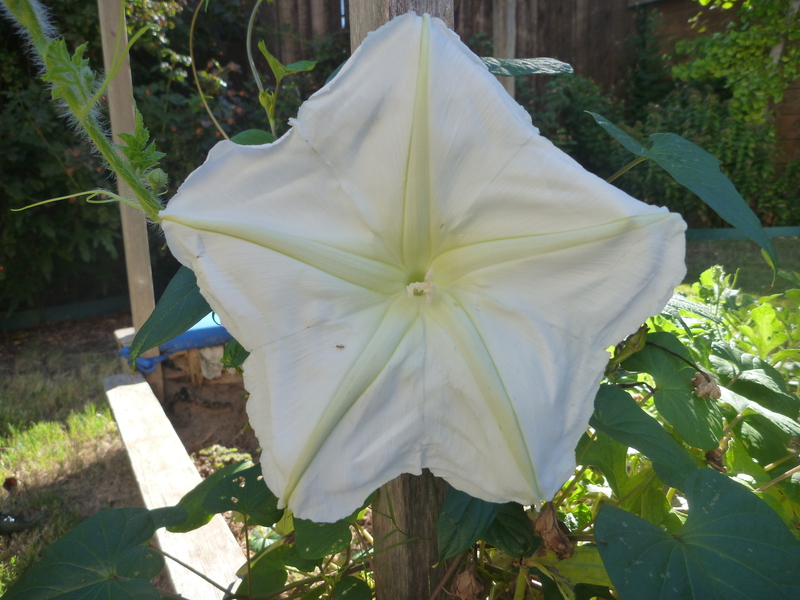 The moon vine (ipomoea alba) is related to the morning glory, but unlike its cousin, it blooms at night. When planting, I take into account the appropriate season, soil warmth, and rainfall—but the moon? Most nights I don’t venture outside to drink in the scent of my moon vine’s blooms or to soak in moonbeams. I go through most of my life without knowing what phase the moon is in, without opening myself to the wonder of the night sky. I feel a fun experiment for the kids coming on this spring. What an enchanting suggestion the clocksmith gave as to why some of my plants grow twice as large as expected and others remain unusually dwarfed and delicate! I suppose it is just folk lore, but it is freeing to “suspend disbelief” for a moment and breathe in a mystery. Inhale and exhale, like the tide; like the soil? I’m reminded of Jason Gray’s song, “The Name of God Is the Sound of Our Breathing.” (Consider listening, here.) The clocksmith planted a beautiful idea in my mind: Even the earth breathes the Creator’s name. The moon is full tonight as the grandfather clock ticks the song of time. It is a gentle ticking, a comforting ticking, for before, during, and after time, is God. This entry was posted in Gardening and tagged Gardening, grandfather clock, Jason Gray, moon dial, planting according to the phase of the moon. Bookmark the permalink.